The Lehigh Valley rollergirls are a different team. I don’t mean this regarding personnel, in fact if anything the 2012 Lehigh Valley Rollergirls have finally settled into a consistent stable of players. After several major roster defections and retirements in mid to late 2011, the remaining members have coalesced. Veteran skaters are forming a tight bond and working well as a unit. Incoming fresh meat have shown enthusiasm and determination, with many of them earning roster spots on both the A and B teams, while others wait in the wings; training and preparing for their debut. Rose Beef, who enjoyed a brief retirement last season, quickly realized life on the sidelines wasn’t for her. 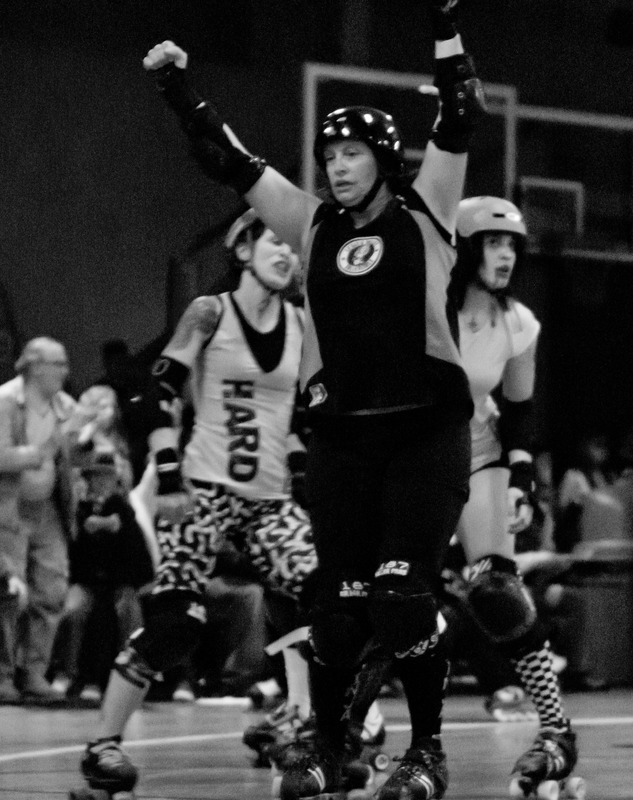 She emerged from retirement to compete in the final home bout of the 2011 season against Rocktown. During the off season she took on the role of Head Coach and this has become one of the most advantageous moves the team could make. Rose Beef is serious, tough and determined. Her coaching style is to push each member of the team beyond their perceived limits, crafting them into well oiled cogs who fit together to power the team. For all her outward toughness she is incredibly likeable by both fans and team mates alike. Many coaches will say it doesn’t matter if their team likes them, they are not there to make friends, but I disagree. A good coach can be tough when it is time to get down to brass tacks, but they should also be a friendly ally off the track. An effective coach is a mentor not a brutal task master. Team members respond best to kindness and are more willing to test personal boundaries. As player-coach Rose Beef is the right match to light the flame. Lehigh Valley’s opening day began with an air of excitement. Like last season, fans were queued around the building waiting to take their seats on what was a dreary late March day. Unlike last season, Lehigh Valley anticipated the large crowds and had the rink well prepared for their impending entrance. Quite a lot more chairs were provided, eliminating the need for fans to bring their own. Rows and walkways were neatly arranged and areas were designated for media personnel and disabled fans. Inside the arena there were representatives from several media outlets covering the opening day activities. We spied our friend and derby photographer, Jim Rhoades with his family in tow shooting the action. For some truly amazing derby photos I suggest you check out his site. Jim can usually be found at most LVRG bouts as well as covering Dutchland and other area teams. Also on hand was a video crew from the Lehigh Valley Mirror, interviewing team members, fans and even yours truly. You can catch their show on RCN cable TV channel 4 and also online via their website. 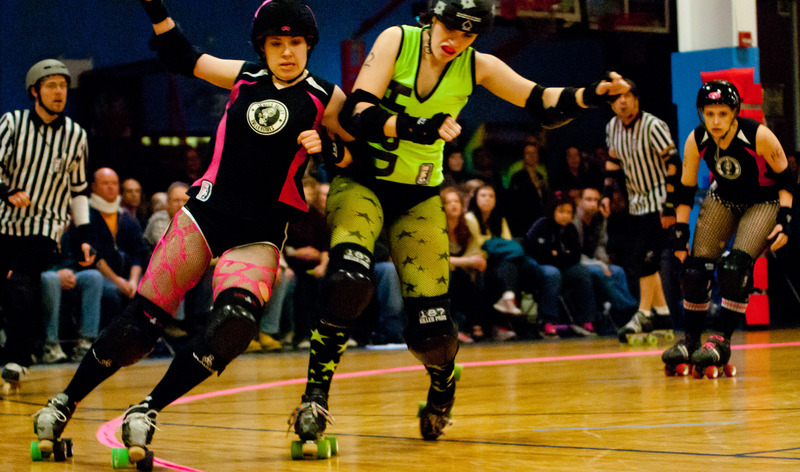 We’ll provide a link to the roller derby episode once it is available. Now on to the bout action; I want to say although I stated in the headline that LVRG left hard flaccid after the bout, let’s make no mistake there’s nothing soft about this team. When last these two opponents squared off Lehigh Valley was the one needing Viagra after suffering a thrashing at the hands of Harrisburg and falling by a score of 161 to Harrisburg’s 211. These ladies from our capital city mean business! One look at them and you’ll know it, they arrived at the IFFC with their games faces on. Sporting their trademark nuclear lime green uniforms with HARD written in a bold font along the side, they looked fresh and ready to take Lehigh Valley down the path to destruction once again. If you were a betting person, the odds on favorite going into the bout would be Harrisburg. But if you were present during the three open scrimmages that Lehigh Valley held prior to the start of the season you would have seen how vastly improved this Lehigh Valley team is from last year. This match would not be a guaranteed win for HARD. Promptly at 6pm the first whistle blew and the action began at a furious pace. Both teams came out of the gate with claws out. Fasten your seatbelts it’s going to be a bumpy ride! Lehigh Valley put some digits on the scoreboard in the second jam of the bout courtesy of #47 Happy Feet. The numbers continued to climb in quick succession as Lauranimal, Vanilla CreamHer, and Roxxy Foxx all contributed points in their respective jams. 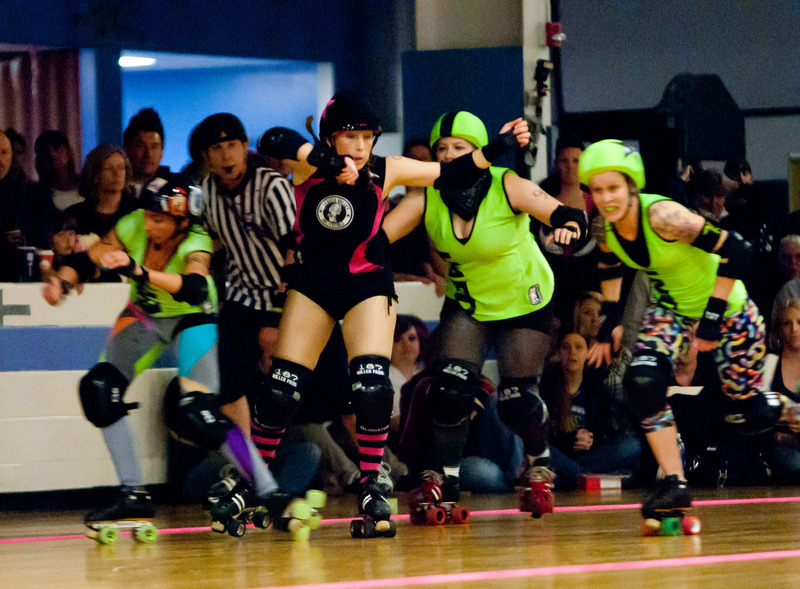 Lehigh Valley’s team of blockers worked well to prevent Harrisburg’s jammers from gaining any ground. 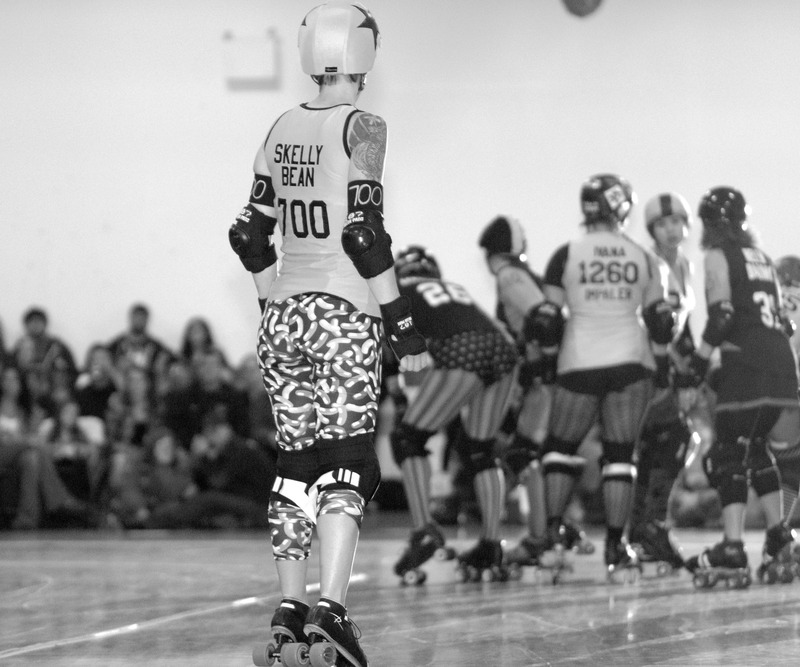 The bout was a shutout until the 10th jam when #700 Skelly Bean was able to finally grab a point for Harrisburg. Lehigh Valley continued to pile on the points with Harrisburg unable to do more than slowly chip away at the mounting deficit. Harrisburg fought hard to break through the pack; solid hits were thrown on both sides with rollergirls sliding into the fans seated in the suicide section on more than one occasion. Fortunately, and quite surprising, there were no major injuries especially considering the aggressive jousting between the teams. Making an impressive debut as a first time Jammer for HARD was #3000 Mystery Violence Theatre, who was able to add substantially to Harrisburg’s point count. Unfortunately for Harrisburg the curtain came down on the first half with Lehigh Valley ahead by a score of 81-38. Other notable performers for Harrisburg were team Captain Rainbow’s Revenge, Co-Captain Neve Cannibal, Jammers Trixie 12 Guage and Merry Khaos. During the halftime the skaters took a much needed break, coaches gave pep-talks and fans enjoyed the musical entertainment from the Bridge Street Bluegrass Band. The choice in live entertainment was certainly a departure from the harder rock acts that dominated last year’s LVRG halftime schedule. Fans could be seen knee slapping and “doe si doeing” across the neon speckled rink rug. Hats off to the bout production staff for their creative music booking. Both teams had merchandise available for sale, and Lehigh Valley conducted their usual 50/50 raffle. Lehigh Valley introduced T-Shirts with bold new designs for 2012. Consider supporting the teams (home and visiting) by picking up a shirt or two. Generally T-Shirts are $15 from most teams. The halftime melted away like an ice cream cone on hot asphalt and it was time to begin the second half. Whatever pep-talk Harrisburg may have received, seemed to work as they adjusted their strategy and began to pile up points at a faster pace than during the first half. Both teams were playing rough and tumble. Rose Beef got a few solid shots in as did Chikki 6am early in the 2nd half. LVRG’s Lin Diesel, Loogie Vuitton (who also had a go around as lead jammer in the 2nd half before winding up in the penalty box), Helen DaRink, Levelin Levi, Daisy Destructo, Phish Tahko and Hussy were all an effective barrier throughout the bout to maintain their lead over Harrisburg. This match also saw the welcome return to active skating by Minerva Steel. While Harrisburg was ultimately unable to overcome Lehigh Valley this go around, they managed to slow down Lehigh Valley’s rate of points accumulation while narrowing the divide in the final score to within 19. Final Score: LVRG 155-136 HARD. MVP’s were Lehigh Valley’s team Captain, Vanilla CreamHer and Harrisburg’s Co-Captain, Neve Cannibal. They were each awarded custom handcrafted trophies courtesy of the mega-talented Jamie Dean. Joining Lehigh Valley’s resident announcing duo Shasty and Philly Cheezteak was guest announcer Max the Axe from Harrisburg. His commentary was a perfect complement to the home team’s announcing duo. Remember, your announcers know what’s going on so you don’t have to. Harrisburg may have left the Valley on the losing end of this season opener; but rest assured they will regroup and place Lehigh Valley firmly in their crosshairs for their next face off. Craving more Lehigh Valley roller derby action? Well, you’re in luck. This coming Saturday (April 14th) the girls take on New Jersey’s own Garden State Iron Maidens at IFFC. Doors open at 5pm, First whistle at 6pm.